(NEW YORK) - The Hockey Foundation, in partnership with Hockey Tutorial and with a host of sponsors led by Sun Life Financial, is pleased to announce the start of a new season of youth ice hockey development camps in India, which began on January 12, 2016. As a steadfast proponent in introducing and improving the game of ice hockey to children in less fortunate regions of the world since 2011, The Hockey Foundation's 2016 season will be setting new records by sending more coaches from the United States and Canada, training more players and donating more equipment than in years past, all while reaching new locations within India. The program, which is made possible by a host of sponsors and donations, welcomes back Toronto-based Sun Life Financial for a second straight year as program sponsor to accomplish these new milestones. "This is a season of incredible growth and record-setting for our India hockey development program, due to the strategic sponsorship and partnership of our organization this year," said Adam Sherlip, Executive Director & Founder of The Hockey Foundation. "Our dedicated team of volunteer coaches will be coaching hundreds of children around India, while simultaneously distributing hundreds of pieces of equipment to local clubs and associations, which is only possible by the generous support of donors and sponsors, specifically Sun Life Financial, who is dedicated to promoting active lifestyles and improving the quality of life for people around the world, and especially via our efforts on and off the ice." The Hockey Foundation and Hockey Tutorial will be updating followers with updates via respective social media channels, as well as posting blogs, photos and video to The Hockey Foundation's website, www.hockeyfoundation.org, over the duration of the program, which will last through March. Cambridge, England-based Hockey Tutorial will be on hand as a major partner this season in the picturesque Himalayas to create more of their renowned instructional videos and bring The Hockey Foundation's camps to life. The two organizations will release videos throughout the trip, as well as a co-produced video at the end of the season to encompass the full program. "We're extremely excited to be here in India along side The Hockey Foundation, changing the lives of passionate hockey players, one puck at a time. Our aim is to widen the exposure of the work THF and it's partners are doing here in India by creating a spectacular piece of video detailing the incredible story of hockey in India and the wonderful people involved," said Chris Kibui, founder of Hockey Tutorial. ILSC (formerly International Language School of Canada) is once again on board to donate hundreds of books to local schools, shifting its focus from supporting sports to English education in the region. The school has been engaged in supporting an ice hockey project in the Indian Himalyas alongside the Canadian High Commission in Delhi and The Hockey Foundation over the past four years. The Hockey Foundation grew out of a 2009 volunteer trip Sherlip took to Ladakh, in the Indian state of Jammu & Kashmir, following a coaching stint in China on behalf of the New York Islanders. Ice hockey has been played in Shimla, in the state of Himachal Pradesh, directly south of J&K, since the 1920s when it was introduced by the British living in this "hill station" retreat from the Delhi heat. In the 1970s, Indian soldiers stationed in the high-altitude border region of Ladakh took up the game to keep fit in the winter, and it has steadily grown in popularity throughout the region since that time. 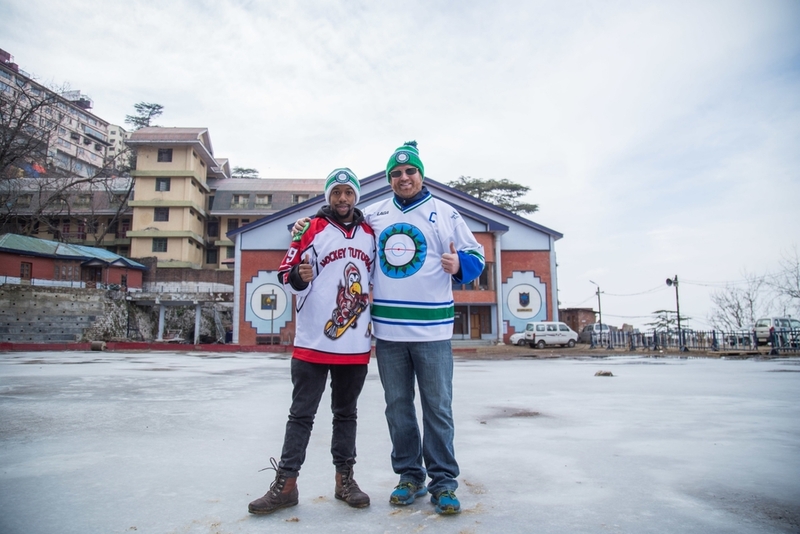 Settled high in the Himalayas, these two regions have established unique hockey cultures of their own. Lack of equipment and resources to support development of the game in India is where The Hockey Foundation comes in. Sherlip built upon his successes running on/off-ice hockey coaching clinics at SECMOL (Students' Educational and Cultural Movement of Ladakh), a school dedicated to helping children pass grade 10 exams while learning practical life skills and maintaining their campus that houses an outdoor rink overlooking the Indus River. It was here that Sherlip created a program that was the catalyst for creation of The Hockey Foundation. One of the fruits of Sherlip's early labors was his appointment as head coach of the first Indian Men's National Hockey Team, which participated in its first international competition in the International Ice Hockey Federation (IIHF) Challenge Cup of Asia (CCOA) in Abu Dhabi, UAE in 2009. Since then, Sherlip has ran the bench for the team in 5 CCOA's and succeeded in bringing Team India to Ontario, Canada and organizing an exhibition game against the Brampton Beast (ECHL) in October 2015 to further promote the development of Indian ice hockey. "Our goal is to connect passionate hockey people around the world to one another, starting with the children," Sherlip said. "To date we've coached nearly 2,000 players and donated nearly 4,000 pieces of equipment across India. The game has improved dramatically, but there's still so much to do. We want to keep supporting the development as the official coaching partner of the Ice Hockey Association of India, and see friendly hockey games being played by people of different genders, religions, races, socio-economic status, etc, while providing children around the world with life-changing opportunities via ice hockey. India's just the beginning." Further details regarding the program for this season in India and beyond are forthcoming. The Hockey Foundation's ongoing mission is simple: grow the game of hockey by using its powerful lessons to empower children, support community development and foster international understanding and cooperation in remote/under-served regions of the world -- one puck at a time. Established in 2011, THF helps by donating hockey equipment to programs without access, providing on/off-ice coaching to as many players as possible and distributing hockey books for children in these regions to improve literacy. With the help of sponsorship, donors and a dedicated staff, The Hockey Foundation aims to enhance, teach and reinforce character strengths found in hockey such as teamwork, selflessness, accountability, honesty and resilience. Please contact us at hockey.foundation if you want to be a part of our team, sponsor, donate or learn more about our program.